Save up to £40 on your season ticket! 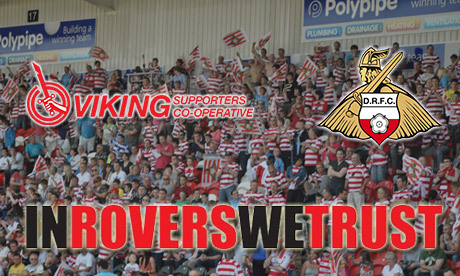 Doncaster Rovers have teamed up with the Viking Supporters Co-operative to provide our members the opportunity to secure money back on their 2014/15 season ticket. Hurry - this promotion expires at the end of May 2014! Following the close of the early bird deadline last week, Doncaster Rovers season ticket sales were just short of 500 higher than at the close of the early bird deadline in 2013. While season tickets have now reverted to full price, members of VSC can use their membership to claim the full price difference (between the full price and early bird price) back. If you have any questions just email membership@drfc-vsc.co.uk or contact the Membership Officer via the Viking Chat Forum. The referral scheme provides fully paid members of the VSC the opportunity to receive money back on their season ticket purchase. The money received will be the full price difference between the early bird price and the full price for the season ticket that is purchased. To take advantage of the referral scheme season ticket applicants must state “Referred by VSC” on their season ticket application form. Once the club has received the full payment for the season ticket, they will contact the VSC to inform us that the season ticket application has been completed. The club will then pay the price difference between the early bird price and full price back to the VSC, and we will pass on all of that price difference back to the supporter. 3. Season ticket applicant must state who they were referred by on their application form at point of purchase. 4. Doncaster Rovers will pay the price difference between the full price and the early bird price to either the VSC (less any administration fees). 5. Doncaster Rovers will inform both the supporter and the relevant supporter organisation when the season ticket application has been completed (this will be when full payment of the season ticket has been received). 6. The club will pass on the referral fee to the VSC within 30 days of the season ticket application being completed. 7. The VSC are responsible for providing full payment in the price difference back to the supporter.